For other people with similar names, see Ian Matthews (disambiguation). Iain Matthews (born Ian Matthews MacDonald, 16 June 1946) is an English musician and singer-songwriter. He was an original member of the British folk rock band Fairport Convention from 1967 to 1969 before leaving and forming his own band, Matthews Southern Comfort, which had a UK number one in 1970 with a cover version of Joni Mitchell's song "Woodstock". Born in Barton-upon-Humber, Lincolnshire, Matthews was known in the 1960s as Ian MacDonald, but changed his name to Ian Matthews (his mother's maiden name) in 1968 to avoid confusion with Ian McDonald of King Crimson, with whom Judy Dyble began working when she left Fairport. In 1989, he changed the spelling of his first name to Iain and has been known as Iain Matthews ever since. Influenced by both rock and roll and folk music, he has performed as both a solo artist, and as a member of various bands. He was a member of Fairport Convention during the early period when they were heavily influenced by American folk rock and sang on their first three albums before leaving in 1969. He initially embarked upon a solo career before forming the bands Matthews Southern Comfort and then Plainsong. Later in his career he was also a member of the bands Hi-Fi, No Grey Faith, and More Than A Song. In a career spanning over fifty years he has featured on over 100 albums and in 2018 published an autobiographical book, “Thro’ My Eyes : A Memoir’’, about his life in the music industry. Matthews' family moved to Scunthorpe, Lincolnshire, when he was twelve years old. On leaving school at sixteen, he initially worked as an apprentice signwriter for a local painting and decorating firm. During the British pop music explosion of the mid-1960s, he sang with several local bands in Scunthorpe and then moved to London in the spring of 1965, taking a job in a Carnaby Street shoe shop, Ravel. In 1966 he formed a trio, The Pyramid (later just Pyramid), a short-lived English surf music band, with Steve Hiett and Al Jackson. The Pyramid released one single, "Summer of Last Year" in January 1967, on Deram Records. A remaining song, "Me About You," surfaced on Matthews' Orphans & Outcasts Volume 3 in 1999. In the spring of 1967, Matthews was recruited by Ashley Hutchings as a male vocalist for Fairport Convention, where he sang with Judy Dyble on their self-titled first album Fairport Convention and then with Sandy Denny on What We Did On Our Holidays. During the recording of Unhalfbricking in 1969, as Fairport increasingly drew their material from a traditional British folk repertoire, Matthews found out he had not been invited to a recording session and, after a short discussion with producer Joe Boyd and Ashley Hutchings, left the band and departed on a musical direction of his own. In 1969 Matthews recorded his debut solo album, Matthews' Southern Comfort, which was rooted in American country music and rockabilly. He made the album with ex-Fairport colleagues Richard Thompson, Simon Nicol and Ashley Hutchings, plus guitarist Mark Griffiths, drummers Ray Duffy and Gerry Conway, pedal steel guitarist Gordon Huntley, and keyboardists Dolly Collins and Roger Coulam. This was his first significant experience as a songwriter, although the band did also cover versions of Neil Young and Ian and Sylvia songs. He followed it up by forming a working band, Matthews Southern Comfort (using the name of his first album, but without the apostrophe), releasing two more albums in short succession, Second Spring (1970 – UK #52) and Later That Same Year (1970). The band went through various different line-ups and toured extensively for the next two years. They had one commercial success, a cover version of "Woodstock" by Joni Mitchell which was a number one hit single in the UK Singles Chart in October 1970. It received heavy airplay in Canada, reaching No. 5, as well as peaking at No. 23 on the Billboard singles charts in the United States in 1971. Afterwards, Matthews left Southern Comfort, who went on to release three albums of their own on Harvest Records. In 1971, Matthews recorded two solo albums (If You Saw Thro' My Eyes & Tigers Will Survive), on Vertigo Records. Under the sponsorship of former Yardbird Paul Samwell-Smith, and surrounded by likeminded British semi-folkies (notably another ex-Fairporter, Richard Thompson), he formed Plainsong with Andy Roberts, previously of The Liverpool Scene. The band's line-up consisted of Matthews, Roberts, guitarist Dave Richards and American bassist Bob Ronga. In 1972 Plainsong released In Search of Amelia Earhart. The album included a cover of Dave McEnery's "Amelia Earhart's Last Flight", plus a song by Matthews, "True Story of Amelia Earhart's Last Flight". The song is based on research that suggests that Earhart may have been spying on Japanese bases in the Pacific islands. It also included "Even the Guiding Light", an answer to Thompson's "Meet on the Ledge". After Plainsong collapsed due to a bandmate's alcohol problem, and with his career now based in Los Angeles, Matthews released several more albums with ad hoc bands: Valley Hi (1973), produced by Michael Nesmith, (formerly of the Monkees); Journeys from Gospel Oak and Some Days You Eat The Bear (1974); Go For Broke (1976) and Hit and Run (1977). None of these met with commercial success. Valley Hi featured a cover of the Steve Young song Seven Bridges Road, arranged by Iain Matthews and Nesmith, creating a multitracked harmony with all parts sung by Matthews. This version became famous after being covered live by the Eagles on 28 July 1980 and released on Eagles Live. With lack of success on his albums, Iain Matthews went from Elektra to Columbia Records, to the small Rockburgh label, where he scored a hit single in 1978 with a cover of Terence Boylan's "Shake It", which reached No. 13 on the US charts. He had a moderately successful follow-up covering Robert Palmer's "Give Me an Inch". However, the North American rights for his album Stealin' Home and its follow-up Siamese Friends were held by the small Canadian label Mushroom. When label-owner Shelly Siegel died in 1979, Matthews' association with that label came to an end. The song "Shake It" is heard at the beginning of the 1980 movie Little Darlings. It can also be heard on the radio in the game The Warriors from Rockstar Games. Matthews' official web site states that at this point he "had been struggling for nearly 15 years now and was still living hand to mouth, with nothing to show for his efforts but a string of out-of-print albums, and the loyalty of those musicians and fans who shared his vision." He moved from Los Angeles to Seattle, where he teamed up with David Surkamp, formerly of the St. Louis band Pavlov's Dog, to form the power pop band Hi-Fi, whose repertoire included Matthews' originals, but also covers of Neil Young's "Mr. Soul" and Prince's "When You Were Mine". He worked in an A&R capacity at Island Records and then Windham Hill Records. Starting in 1977, Fairport Convention held the annual Cropredy Festival. In the mid-1980s, there was interest in reviving the band and recording new material. Matthews was invited to perform with them as a part of the band, and in their other projects, at the 1986 Cropredy Festival. This led to Walking a Changing Line (1988) on Windham Hill, a tribute to Jules Shear of Jules and the Polar Bears. This beautifully produced effort was the first vocal album ever released by Windham Hill. Matthews then moved to Austin, Texas and recorded several albums for a series of German independent labels. He appeared with Andy Roberts at the 1992 Cambridge Folk Festival, which led to the first of what became several changed versions of Plainsong. 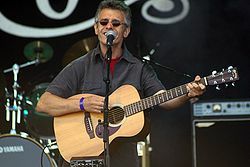 In 2000 Matthews moved to Amsterdam, where he became involved in independent music projects and collaborations, including the Sandy Denny tribute band No Grey Faith (an anagram of "Fotheringay," which was the name of the castle in which Mary, Queen of Scots was imprisoned, as well as the title of a song about the castle that Denny had recorded for Fairport Convention, and the name of a short-lived band Denny had led in the 1970s), and another revival of Plainsong. Moving to Horst in the south of the Netherlands, in 2008 he produced Joy Mining with the Dutch jazz ensemble, Searing Quartet. In September 2010, he released the first Matthews Southern Comfort album in 40 years and returned to a major record label. Since 2003 Matthews has worked with Dutch pianist and composer Egbert Derix. They met when Matthews, a jazz fan, came to a concert of Derix's Searing Quartet in Cambrinus (Horst, The Netherlands). Matthews asked Derix to join him in his 2003 tour of his 1970 album If You Saw Thro' My Eyes. They played a series of concerts with Eric Coenen (bass), Arthur Lijten (drums) and Ad Vanderveen (guitar). After the tour Matthews and Derix started writing together, resulting in the 2008 album Joy Mining Matthews & Derix started their own label: MatriX. In 2012, the Iain Matthews/Egbert Derix album In the Now was released by Verve Records. Joy Mining and In the Now had separate releases in the United Kingdom and United States. In January–February 2015 Matthews and Derix toured in California to promote the US releases of their albums. Dutch filmmakers Peter Jong and Olivier Hamaker made a documentary about the making of In the Now. Matthews can also be heard on Egbert Derix' solo album Paintings in Minor Lila (2012) on which the music of British progressive rock band Marillion is featured. The album has contributions by Matthews, Marillion singers Fish and Steve Hogarth, and Supertramp saxophonist John Helliwell. Matthews was guest vocalist in 2011 on the Helliwell/Derix Quintet tour in The Netherlands. Matthews and Derix co-wrote eight songs for Matthews's solo album The Art of Obscurity (2013). Matthews is a season-ticket holder at Scunthorpe United football club. I Can't Fade Away DVD (2006) Cherry Red (features a full show from Iain and his band at the Marquee Club in London in 1984). Limited edition 5CD archival box set containing Live Alone, Intimate Wash, Camouflage, Nights In Manhattan And Points West, plus a fifth, then unreleased CD, Woodshedding. ^ Chris Woodstra (8 October 1996). "The Seattle Years 1978–1984 – Ian Matthews | Songs, Reviews, Credits, Awards". AllMusic. Retrieved 5 May 2014. ^ Nettleton, Paul. "Old music: Matthews Southern Comfort – Woodstock : The second best Fairport Convention singer secured a UK No 1 only to move on, leaving solo success behind". The Guardian. Retrieved 17 January 2012. ^ a b Unterberger, Richie. "Iain Matthews Interview". ^ "Website for Iain Matthews memoir". Thro'My Eyes: A Memoir. Retrieved 4 December 2018. ^ a b Roberts, David (2006). British Hit Singles & Albums (19th ed.). London: Guinness World Records Limited. p. 355. ISBN 1-904994-10-5. This page was last edited on 10 February 2019, at 15:47 (UTC).